We headed to St Katharine Docks this morning and the marina looked so pretty with all the flowers in bloom. We went for brunch at White Mulberries, a cute little cafe on the dock. Tom had his usual salmon on toast combination. I ordered a Charcoal Matcha Bowl which came topped with all kinds of berries and nuts. The Walthamstow Pumphouse Museum was having an open day to celebrate 50 years of the Victoria Line. We arrived 10 minutes before it closed, so we had a super fast look around. Luckily the museum wasn't too big so we were able to see it all. They had a couple of old Victorian Line trains parked outside. Tom was excited to see a drivers chair exactly like the one that he'd bought as an office chair a few months ago. As well as the trains and the pump house, there was also a little fire engine museum. We then headed into Walthamstow, spotting so much awesome street art on the way. We parked up next to another Figgy on Wood Street and they looked so cute together. We wandered through Wood Street Indoor Market which was filled with all kinds of cool shops, stalls and restaurants. 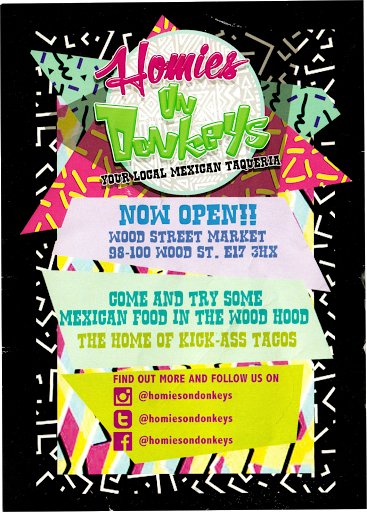 We then stopped off for tacos at Homies on Donkeys. We had the Camarón Enchilado tacos which came served in blue corn tortillas with prawns, chilli & garlic marinade, cheese and pickled onions. We then headed up to Beavertown Brewery to pick up some cans of beer to take home. Pressure Drop Brewing was right next door, so we picked up a few of their beers too.